Graphic Arts, Inc. has been Austin's pre-press film authority since 1987. 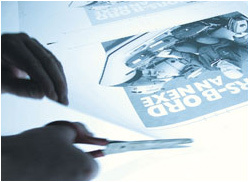 We offer traditional pre-press services, including camera line shots, halftones and metal plates for offset printing, as well as state of the art digital services. Our background and expertise in the printing industry uniquely qualifies us to serve printers, graphic designers, silk screeners and artists with the highest quality of digital output for film separations, high-resolution digital scans, PDF file conversions, and all of your pre-press needs. We also offer complete graphic design solutions, website design & hosting, and many other printing/graphic design services.